Johnny cash, John Hiatt, The Felice Brothers, Die Skynmaagde, The Lonely Island and more. 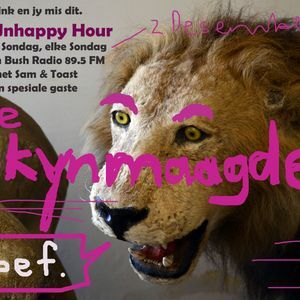 The Unhappy Hour broadcasts on Bush Radio 6-8 pm in and around Cape Town, South Africa, every Sunday on 89.5FM. This show was hosted by Toast Coetzer and Sam Reinders with the band Die Skynmaagde live in studio.